Calgary Stampede Downtown Attractions | Start Stampede Downtown! SEE YOU JULY 6, 8-13, 2019! DO YOU WANT TO HAVE FUN? LET'S GET IT STARTED! The Calgary Stampede Downtown Attractions Committee (DTA) wants all Stampede visitors to have a hand clappin', toe tappin' and belly bustin' good time! At Fluor Rope Square, every day starts with a bacon pancake served hot off a chuckwagon or smokie. We follow up with great daily FREE activities including live entertainment, square dancing, clowns, Old Time horse drawn rig rides and the Indian Parade. Come join us downtown at Fluor Rope Square in Olympic Plaza and along Stephen Avenue. Our friendly and knowledgable Downtown Attractions volunteers at our information booths are happy to assist you and answer any questions, so that you can get into the Stampede spirit! ALL events and activities hosted by Downtown Attractions are coordinated by volunteers and ALL are FREE! Learn more about what we do, how to get DTA at your next event, our history and FAQ's. Fluor Rope Square presents square dancers, singers, fiddlers, friendly mascots, High Noon Hootennany plus so much more Stampede-style entertainment! Let us help you find the action! Downtown Attractions includes events and activities at Fluor Rope Square in Olympic Plaza and along Stephen Avenue. We'll feed you... entertain you... and have you dancing in the streets. Thank you to our sponsor - Fluor! ALL events and activities hosted by Downtown Attractions are coordinated by volunteers and ALL are FREE! 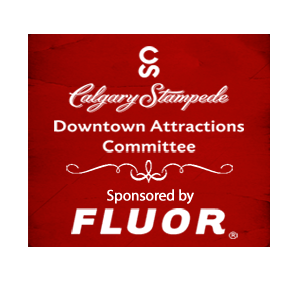 Downtown Attractions has evolved into the largest Calgary Stampede Committee with over 325 year-round volunteers. During Stampede week, we are joined by another 180 volunteers from Fluor, our major sponsor. We appreciate everyone's tremendous participation. Follow us or post a selfie at Fluor Rope Square for a chance to win a Stampede Experience prize package!